Stephanie Teufel studied Informatics / Computer Science at the Technical University of Berlin and the Swiss Federal Institute of Technology Zurich (ETH). From the University of Zürich she received her Doctor's degree. She was a lecturer at the University of Wollongong, Australia, and a university professor for Management Information Systems at the Carl von Ossietzky Univer­si­tätOldenburg, Germany. Since April 2000 she holds a full professorship in ICT-Management at the Faculty of Economics and Social Sciences, the University of Fribourg, Switzerland. 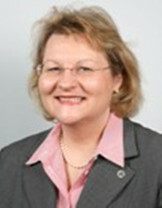 Furthermore, she is the director of the international institute of management in technology (iimt). She is author/co-author of a multitude of scientific publications and books and a member of numerous national and international boards and committees. Major research interests: Innovation and Technology Management, Energy Systems Management, Management of Information Security, Project Management.